"The City I" by artist Vincent Valdez at the Blanton Museum of Art. The City, by Texan artist Vincent Valdez is presented in two parts. The smaller of the two pieces, The City II, depicts a pile of mattresses and garbage in gray scale. The larger, less pedestrian, piece is a 30-foot-long mural, sprawled across four canvases, depicting a meeting of the Ku Klux Klan. 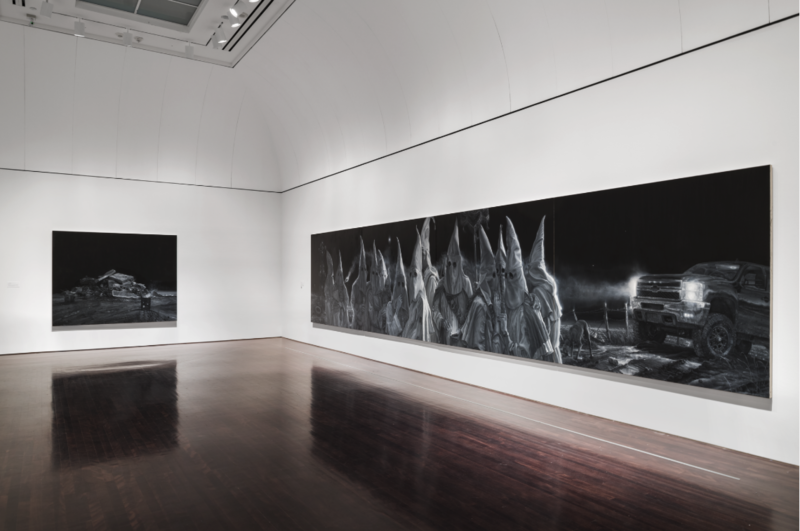 The City I, which debuts at the Blanton Museum of Art today, shows a group of men, women and an infant assembled in Klan garb; a Chevy truck’s headlights bathe the figures askance in light, while one figure checks his phone and a cell tower looms in the background. Valdez said his representation is meant to show that the legacy of oppression and racism associated with the Klan shouldn’t be confined to the fringes of society – or rural communities. These people could be anyone, he said in a statement announcing the exhibit’s opening. “There is a false sense that these threats are contained at the edges of American society, in small town landscapes or in the American South," he said. The Blanton anticipated the controversy, so, over the course of a year, staff reached out for feedback from more than 100 individuals and community leaders who engage with race and representation issues in Austin – including Mayor Steve Adler's office and the Austin Justice Coalition. "I think it's always important to have difficult conversations around race and the history of hate that we have here in America, especially here in the South. And what better way to do that than through art," said AJC’s Executive Director Chas Moore. He says he doesn’t think the work is too provocative – or that it could embolden those who may share sentiment with the Klan. "If anything, I think the artwork can show how ridiculous and cowardly those individuals actually come across," Moore said. Artist Vincent Valdez, in front of part of his exhibition, "The City," opening today at the Blanton Museum of Art. Veronica Roberts, the museum's modern and contemporary art curator, says The City is like any other great book or piece of music. "It has the capacity to help us confront difficult subjects like the Klan and the deeper issue of structural racism that goes beyond individuals or specific organizations," she said. However, despite a wide arc of outreach, The New York Times reported yesterday that museum staff only a few weeks ago reached out to Austin’s NAACP chapter. The longtime head of the chapter, Nelson Linder, was disappointed at having not been invited to take a look at the exhibit before it opened. Asked what he thought about this particular lapse by the museum, Moore said he believed the museum staff did not have any duty to reach out for permission about what artwork they see fit to exhibit. The City will be on display tonight and Valdez will take part in a discussion with Maria Hinojosa, host of NPR’s Latino USA. View the Blanton's brochure on the exhibit below.